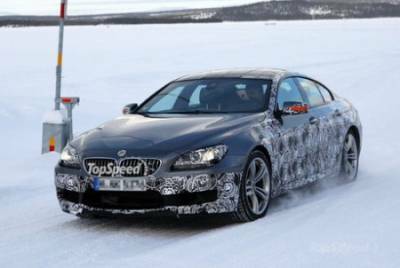 Rumors about the M6 Gran Coupe started to go ever since, as the Bavarian automaker BMW introduced the world to Gran Coupe 6-Series. But now the car was first spotted the paparazzi spies-in tests, confirming the good half of the rumors. But do not expect the car to the end of this year. In predicting car rivals Mercedes CLS AMG, and Audi S7. As recently announced coupe and convertible M6, Grab Coupe will be powered by a V-eight engine of 4.4-liters and output of 560 horsepower. Initial rumors reported that the Gran Sport will increase the power of 20 horsepower. A couple of the engine will svezherazrabotannaya seven-speed dual-clutch transmission. Dispersal to first "hundred" car can carry four and a half seconds. Maximum speed is 250 km / h Auto tell a more aggressive appearance, emphasized by the front part, stern, as well as usual for M-series elements: large wheels and dual exhaust pipes.